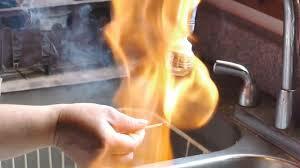 Have you seen those YouTube videos showing folks lighting their water on fire as it cascades into the bathroom sink? Pretty scary, huh? In some parts of the world, including the US, people have unknowingly built their homes over large deposits of natural gas. Most of this gas is trapped in layers of shale deep beneath the aquifers that supply their household water. Hydraulic fracturing or “fracking” is a process used to remove the natural gas from the shale layer, harvesting the gas and making it available for the natural gas market. The big question is how did the natural gas get into the household water?